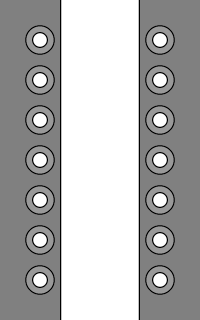 A version of Escher Lacing using U-Lace no-tie laces instead of regular shoelaces. Resembles fish swimming alternately left and right like those from Dutch artist M.C. Escher. 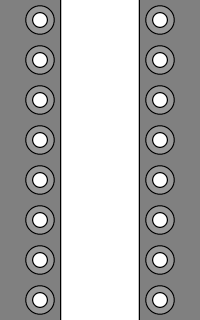 • Use a single U-Lace segment to lace a medium diagonal, starting from the bottom-left eyelet and ending two rows higher (skip past one row). • Continue up the shoe with steep diagonals, each starting from the next lower eyelet and ending three rows higher up (skip past two rows) until the second-from-top row. 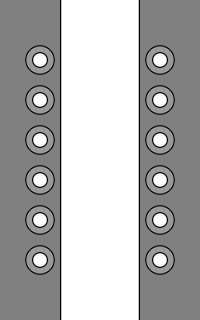 • Lace a final medium diagonal, starting from the next lower eyelet and ending on the top row (skip past one row). • Fill the rest of the shoe with shallow diagonals, each starting from the lowest empty eyelet and ending on the next higher row. • Continue up the shoe with steep diagonals, each starting from the next lower eyelet and ending three rows higher up (skip past two rows) until the third-from-top row. 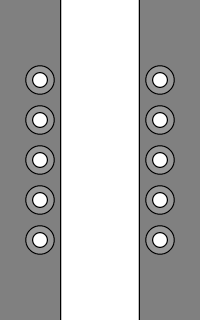 • Lace a final medium diagonal, starting from the next lower eyelet and ending on the second-from-top row (skip past one row). 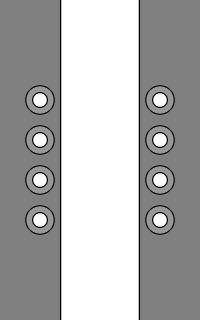 • Use a single U-Lace segment to lace straight across the top row. Converse Chuck Taylor All Star Syde Street Leather Mids with U-Lace Escher Lacing.